Today's Non-League Paper says that the Conference want to see "compelling evidence" that the Bulls can complete the 2014/15 season in order to give the club a green light at the AGM next weekend. The paper claims that the Martin Foyle winding up petition will be adjourned, but the sum will not be reduced, and identifies Mark Ellis, the man named by Bulls News on Friday, as working in a 'proposed' Director of Football role at the club. "I've had contact from someone but we need evidence that the club has changed hands, of who the Directors are, and and so do the FA. So far we haven't had any answers." The paper also reports that assurances have also been demanded of Macclesfield, with both Chester and Dartford possibly facing reprieves in the event that both the Bulls and Silkmen fail to satisfy Conference chiefs. 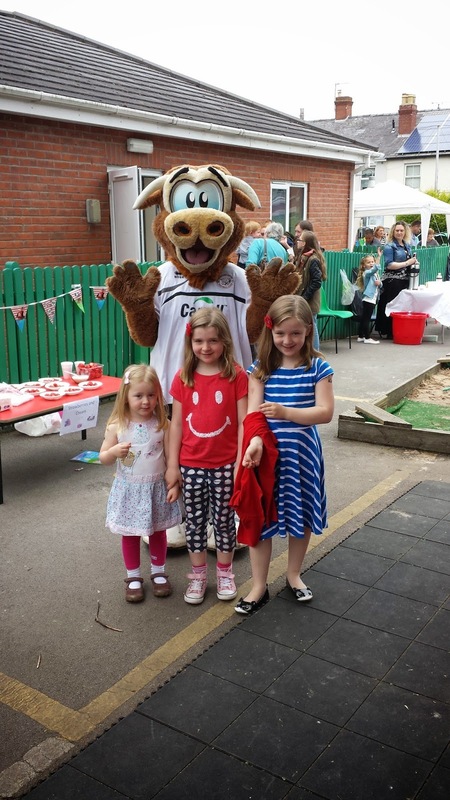 ABC Nursery held their Fete yesterday with Bulls mascot Edgar joining in the fun. 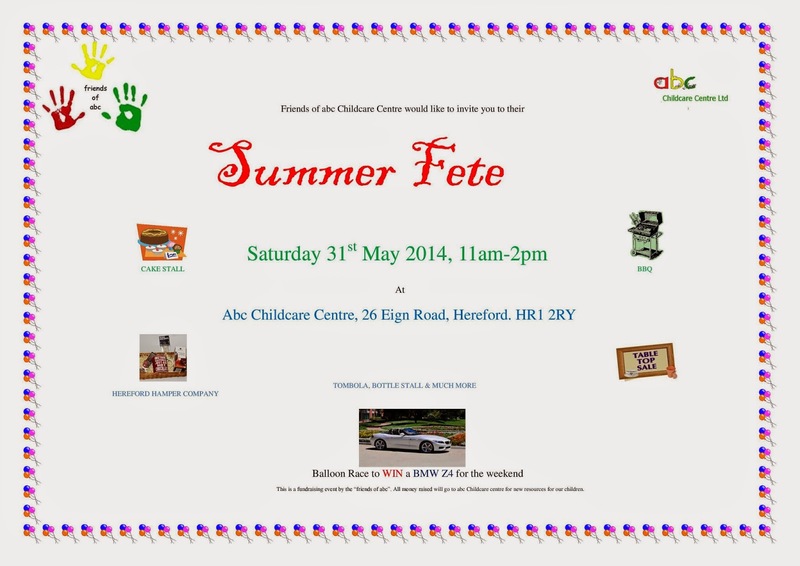 The Friends of ABC raised over £500 from the day to buy equipment for the nursery. Bulls News understands that, while the investors have 'started the process of making payments to football creditors', as announced three days ago, no money has actually been transferred. Several players and staff took to social media yesterday to express their frustration at delays. Fans are calling for clarity from the investors. The latest official statement last night stated that the group had taken on a 'major shareholding' in the club, failing to mention David Keyte at all. Keyte appears to have been cut out of the picture at Edgar Street despite apparently remaining as Chairman. He denied that a trial game had been arranged only for the announcement to appear on the official site yesterday afternoon, while his claims that Peter Beadle was in the frame for the manager's job were also proven false. The club appears to have been sold to new owners, but the fans do not know who wields the power or who will be representing the club at Monday's Court hearing. The fears amongst the fans are that the investors are property speculators, keen only on the 4.5 acres of land that make up the Edgar Street site. Having paid no money so far they could conceivably transfer the two development pieces of the site from the club to themselves, and disappear into the sunset within a week with their names and faces unknown to the fans of the club - leaving David Keyte, and the rest of the board, to face the full wrath of the fans and the authorities over the demise of a 90 year old football club. Or they could be the greatest thing that is about to happen to this club, and it is mere misfortune that has delayed proceedings. They may sort this mess out, have ambitious plans for the stadium and club, and fund the growth of the Bulls into a proud force once again. It is time for our investors, and David Keyte and the board, to come clean and state the facts. They are the custodians of this club and must be accountable to the fans. Alfreton have signed Leamington midfielder Nathan Hicks for the coming season. The 22 year old left Histon in March following their financial problems, ending the season with the Brakes. Two former Coventry chairman have paid £150,000 each to Ricoh Arena operators ACL after the company called in guarantees the pair made that the club would pay it's rent obligations. Bristol Rovers have lost the services of midfielder John-Joe O'Toole after the player activated a release clause in his deal. The 25 year old was one year into a three year deal, and was their 15 goal top scorer this term. The dispute over who owns Swindon will reach the High Court at the end of June. Chairman Lee Power and former chairman Jed McCrory dispute the terms of the transfer of the club between the pair. 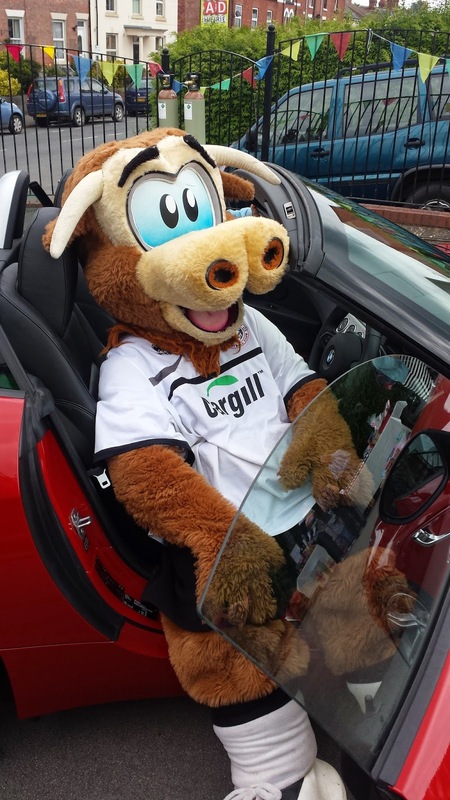 Bulls mascot Edgar The Bull will be in attendance 1.30pm - 2pm as they set off a balloon race to win a BMW Z4 for the weekend. Hereford United have failed to reach agreement at present with Martin Foyle over the outstanding winding up order. Representatives of the consortium who have taken on a major shareholding in Hereford United have failed to reach agreement with Martin Foyle over a settlement to bring to a close the winding up petition by former manager Martin Foyle. Negotiations have continued throughout Friday, but no agreement could be reached. Club representatives will now go to Court on Monday to ask for an adjournment that would enable negotiations to continue. Hereford United have released a statement which in essence asks for more time to agree a settlement with former manager Martin Foyle. The "trial game" for the Bulls, advertised on Twitter last weekend, is going ahead. Representatives of Hereford United will be at a trial game arranged this Sunday at 3pm. The game will take place at Bedfont and Feltham FC. The trial is for invited players only, but Hereford supporters are welcome to attend. Mark Ellis To Be Director Of Football At Edgar Street? More speculation this evening about the 'investors' at Hereford United. It's been suggested to BN that Mark Ellis is to be director of football at Edgar Street. Ellis is a football agent at Crystalsports management. Some years ago he coached at Millwall. Recently he has worked in Nigeria and there is a view that one of the other investors is from that country. One other piece of speculation is that the 'squad' is to be London based and will only travel to Hereford for home games. BBC H&W "Budget Submitted To Conference"
BBC Hereford & Worcester are reporting that the Bulls have submitted a budget to the Conference for next season. Trevor Owens reports that he 'understands' the budget has been submitted, with Andrew Easton reporting that it has been difficult to get information from the club today. Bulls fans are waiting for news on the progress of the investment deal. Wednesday's announcement was that "Investors have started the process of making payments to football creditors at Edgar Street" but there has been no word as yet whether any of these creditors have been satisfied. While current staff, and the players, would not necessarily need to be settled before next Friday's AGM start, Martin Foyle's winding up proceedings would realistically need to see agreement reached today. Petition rules expect an answer by 4pm regarding a challenge to the amount claimed or attendance at Court on Monday. The solicitor listed on the petition, Slater & Gordon, is extensively used by the League Managers Association. It remains unclear whether any other creditor has attached themselves to the petition, with HMRC not classed as a football creditor and yet to reveal their move against the club with a near six-figure sum still outstanding. Fans hope for news, sooner rather than later. Dover report that out of contract winger Moses Ademola has turned down a new deal with the club in order to take a better offer elsewhere. The 24 year old has spent most of his career in Conf South. Wrexham have named Gary Mills (not that one) as their new Assistant Manager. The 33 year old played for boss Kevin Wilkin at Nuneaton, and ended this season on loan at Kings Lynn from Boston. Kidderminster have signed winger Ahmed Obeng on a one year deal from Rushall Olympic. The 22 year old netted 17 times in the Evo-Stik Premier this season with the Harriers to negotiate a fee for his services. Altrincham have signed winger Ryan Crowther following his release from Halifax. The 25 year old scored twice in 14 games for the Shaymen after joining in January after leaving Fleetwood. Bristol Rovers are to trial striker Lewis Taaffe in the summer. The 22 year old Concord Ranger forward was a schoolboy at Leyton Orient before a spell at Histon, netting 15 times in the past season. Aldershot keeper Glenn Morris has left the club to join Gillingham on a one year deal. The 30 year old made 31 appearances for the Shots this term and had been offered a new deal. Bristol Rovers are hoping for a payout of up to £2million if a proposed move of their former striker Rickie Lambert from Southampton to Liverpool comes off. The 32 year old is claimed to be the subject of a £9million bid, with the Pirates holding a sell-on clause from the sale five years ago. Grimsby have announced 'base' Adult admission prices of £18 for the coming season across the board. The cheapest Adult season ticket is £285 with early bird discount. It’s just 31 days until Hereford United Supporters & HUST Members Jack James & Kristina Guntulytė climb/walk/scramble/hike to Wales’ highest peak via the Miner’s Track. The journey to the summit and subsequently back down is said to take around 5 to 6 hours in total and the pair have been scaling the Malvern Hills & the Brecon Beacons in training over the past couple of weeks and have more training planned before tackling Snowdon. Since announcing their climb 13 days ago, they’ve managed to raise over £600 for 3 separate causes and are said to be chuffed to bits with the support they’ve received so far. The primary focus of the fund raising being for the Hereford United Supporters Trust, but also supporting two great charities wholly supported by HUST, the Adam Stansfield Foundation & the newly rebranded United in the Community. Both of these charities strive to promote youth football & develop skills within the community amongst other aims. Which is something that HUST are very supportive of. It is also possible to specify that your donation goes to specifically to one or two of these causes should you so wish. Just let us know on donation. The amount raised for the Hereford United Supporters Trust will be directly ring-fenced towards the purchase of shares in Hereford United Football Club (1939) Ltd. This is so that the supporters of Hereford United can have a greater say in the ongoings at each level of the football club through the Supporters Trust. This is the main aim of the fundraising as specified by HUST Members Jack and Kris. The pair are in a battle to see who raises the most sponsorship, with Team Kris currently leading by a solitary pound. Whilst there is also the prize of a signed Wayne Brown Superman T-shirt for the highest individual sponsor (Currently £50). They are also looking for items to take to the summit to represent Hereford United amongst upto 150 representatives from Wrexham (who have organised the event through their supporters trust) and upto 148 other supporters from other clubs around the country. So if you have something that you'd like to see at the top of snowdon let us know and as long as it isn't big, heavy or awkward, Jack will carry it to the summit. For more information check our website using www.hufctrust.co.uk/fundraising/march-top-wales-snowdon/ (Note: the HUST website is currently down) or email Jack directly jackbjames1990@gmail.com, whilst you are able to download our sponsorship form from the website or use the online GoFundMe website (www.gofundme.com/HUSTwalksnowdon) if you wish to donate towards our walk. Jack & Kris would like to thank you all for your support so far and if you would like to sponsor us please get in touch. They'd love to raise as much as possible. Gateshead have released 11 players including former Bulls loanee Richard Brodie. Brodie was one of three Heed players to spend the second half of the season out on loan, Adam Boyes and Joe Tait also released. Carl Magnay, Luke O'Brien, Jordan Holt, Ryan Noble, and Josh Walker are also released after bit part seasons. Also leaving are experienced forwards Liam Hatch, Colin Larkin, and Jack Lester. Hatch, 32, started only eight Conference games, while Larkin, also 32, scored nine times in a season where he missed three months. Veteran Lester, 38, came out of retirement in February and scored three times in nine games - including a goal in the Play-Off Final. The Hereford Times reports that parking charges in the Merton Meadow Car Park are to rise. Just 18 months after the price rose from £1.50 to £2, Herefordshire Council are set to increase fees to £3 per day. With the charge having been £1 in 2011, the charges will have risen 200% in three years. It has been noticeable that cars have opted to park in the Merton Meadow car park since the Old Market development opened. With parking charges in the new development around £1.20 an hour, the Council would have noticed the number of empty spaces on the development despite good footfall at the shops, cafes, and cinema on offer. In other Merton Meadow news, the old ticket hut at the Blackfriars Street entrance was demolished yesterday. The hut, outside the entrance to Addisons and the Starlite Rooms, had been disused for several years and it is now expected that some resurfacing work will now take place to level the war torn road. The Bulls are looking for supporters who can help provide accommodation to first team players for the coming season. All types of accommodation are required from homely house shares, room lettings to full house rentals. If you can offer a room or have a house or flat available to rent please contact Lee Symonds on 01432 276666 or email club@herefordunited.co.uk for more details. Macclesfield have sold defender Danny Andrew to League One newcomers Fleetwood for an undisclosed fee. The 23 year old was ever present during the Conference campaign having signed from Cheltenham last summer. Wrexham have signed released Cambridge defender Blaine Hudson. The 22 year old U's youth team product spent this season on loan at Welling. Macclesfield say that one, local, individual that is putting together a deal to take over the club. The plan will see the club saved on a sustainable basis, with the hope that a deal can be completed next week. Lincoln chairman Bob Dorrian has called on the Conference to regionalise to cut costs. He says the Imps will spend £20,000 in the coming season on travel to games, with both Bristol Rovers and Torquay adding to their mileage having budgeted £12,500 last season. Torquay boss Chris Hargreaves has called Bristol Rovers' attempts to get their Football League place back 'absolutely futile and pointless'. His Gulls side lost 3-0 to Wycombe on the final day to send the Pirates down. Former Bull Ben Purkiss has signed a new one year deal at Walsall. The 30 year old has spent the last two season at the Bescot Stadium, making only sixteen appearances this term. Forest Green are raising matchday admission prices by £1 to £15 for terrace admission and up to £19 for 'premium' seats. The cheapest Adult season ticket is £280, or £240 with the early bird discount. This years Conference AGM will take place at the Celtic Manor just off the M4 close to Newport. The business part of the meeting will be on the Saturday starting at 11am. There are two football events at Hay Festival today. One of them is a look at the World Cup with, amidst others, Geoff Hurst. This event is set to kick-off at 2.30pm. The other is a discussion with Sol Campbell about his autobiography at 8.30pm. HUST have tickets for the Geoff Hurst event which can be purchased for £5 from the BN/Macmillan car park at the Festival. Please note anyone driving to the Festival should use the park and ride at Clyro, signposted on the A438. Postcode HR3 5LE. Parking close to the Festival is very limited because of the continuing wet weather. The BN/Macmillan car park is very muddy and has been getting 'full' by around 11am. The conditions at the Festival site are reasonable. The tents in which the events are held are 'warm and dry'. 'Representatives from the consortium of investors involved in Hereford United visited the club today. BN also understands that staff have been told they will be paid tomorrow. With little definite news on any investment/takeover coming out of Edgar Street, it's difficult for anyone to be certain of what is going on. But one thing is for sure, the publicity is doing the club no good at all. And today's news that Dan Lloyd-Weston is not going to take up the offer of another contract partly because he hasn't been paid hasn't helped. HUST vice-chairman Martin Watson spoke to BBC H&W earlier this afternoon. "We have been talking to a few of the players, just finding out what they knew, have an exchange of information. "But we are all left in the dark. "For any business to treat their employees that way is very very disappointing." Andrew Easton then asked Watson to explain the significence of only being 48 hours from D day. 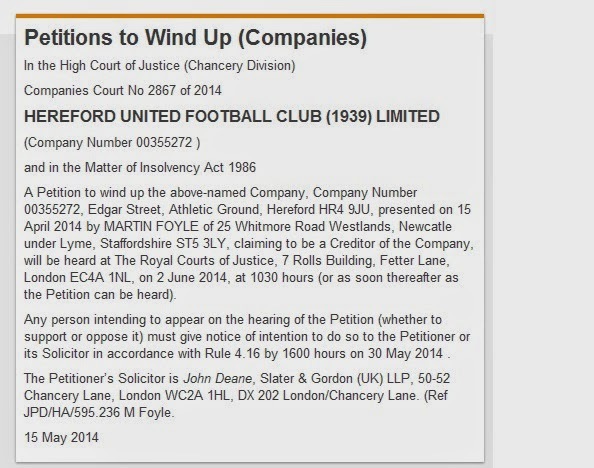 "On Monday morning, June 2nd, Martin Foyle our former manager is bringing a winding up petition against the club. "The club would have to respond to that Friday afternoon, they could run to the Courts on Monday morning with a bag of cash but realistically it's to be done on Friday afternoon. "Again in an interview a couple of weeks ago in the Hereford Times, chairman David Keyte said that the Conference would require a budget by May 30th, so Friday again. "So we're looking at Friday as quite a pivitol day." Easton then asked Watson is it anger, frustration, disappointment, sadness? "Since the Aldershot game David Keyte has been talking about two potential investors and over the last ten days or so that seems to have become one potential investor. "We want a bit of closure, we want something definite. "All these ifs and buts isn't doing us any good. "You don't know what's going to happen." "The money I'm owed might not sound too substantial to some people but, as a percentage of what I am owed contractually, it is a lot. I need it to survive, to put food on the table." "We had that high on April 26th. Then we haven't heard anything from the club. We were then told we'd receive an email every week to notify us of the situation and we haven't received one. "I just think what's the point of making promises if they're not going to keep them. It's unfair and unjust how the club have treated this. It's not like I'm asking for the earth. I'm not a £100,000 a week player from the Premier League. I'm on the equivalent of a minimum wage. "Some lads have got mortgages and children. We kept our end of the bargain. We stayed and did the job. If this was any other club they'd have struggled to put a team out. Anywhere else, the lads would have walked." "I'm disappointed as I've grown really attached to the club and I saw a future here. I had the hunger and desire to do well but my hands have been tied. "The off-field issues have been well documented and I'm now looking to further my career at another club." Speaking to BBC Hereford and Worcester, Bulls' goalkeeper and player of the season Dan Lloyd-Weston has said it's completely unfair that the players have been kept waiting for their wages. He says he has taken the step with regret but the club have failed to honour his contract. "This is my notification to the club, this is what my stance is," said Lloyd-Weston. "I think it's completely unfair just how the club have treated the whole situation with players and management and everyone else around the club." The Board of HUST are deeply concerned at the length of time it is taking to complete the investment deal that will resolve the future of the club. It is 22 days since we met with the Club Board to discuss our £1 offer for the Club. In that meeting we were told that the proposed investment was expected to be completed within 10 days, comments that were made publicly in the Hereford Times two days later. We stressed the need to conduct due diligence on the club in order to ensure that any funds our members put in to our offer were not wasted. Since that meeting we have received no further communication from the Club's Board. David Keyte has already stated that the Conference require a budget for next season by Friday May 30th (Hereford Times, May 15th), and that the club will have to respond to Martin Foyle's Winding-Up Petition by that date also. This means that the club has only 48 hours to complete a deal to satisfy both demands. At this stage HUST has no control over the situation and it cannot force the Club Board's decision, but HUST remains available to consider the options available to it in the short time frame available. We have kept our experienced advisers up to date with the ongoing situation and they remain ready to assist us in any rescue of the club. The Board of HUST implores the Board of Hereford United (1939) Ltd to make their decisions in the interests of the Club and the Fans. Kidderminster have signed goalkeeper Jas Singh for a second time. The 24 year old spent the 2009/10 season at Aggborough, making seven appearances, before spending the last four seasons with Solihull Moors. He comes in as no.2 stopper with Nathan Vaughan having changed his mind on a new deal and leaving the club. Nuneaton have lost the services of England C keeper James Belshaw after he failed to agree a new deal with the club. Ex-Bull Matt Done has signed a new two year deal at Rochdale. The winger, 25, made 44 appearances for the promoted League Two side this season. Worksop Town are reported to be seeking to withdraw their resignation from the Northern Premier League after an emergency supporters meeting on Monday night. The Telegraph reports that the Football League are considering accepting B teams into the Football League Trophy. The 48 team competition would be expanded with 16 B sides from the Premier League and Championship if plans are accepted, with one B team in each group of four. Truro City are trialling departed Bulls youth team keeper Kyle Moore. The teenager previously had a loan spell with Taunton Town. DLW "The Club Has Failed To Honour Agreements"
BBC Hereford & Worcester are reporting that Bulls keeper Daniel Lloyd-Weston is to leave Edgar Street having served notice on the club for breach of contract. He told the station "the club has failed to honour agreements" with more information to be broadcast on the Andrew Easton programme from 4pm this afternoon. Lloyd-Weston was one of six players under the age of 24 to be offered new deals. 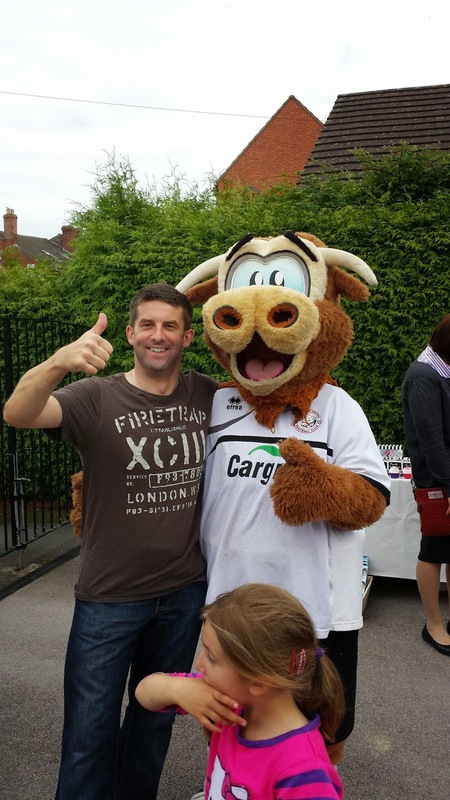 Bulls chairman David Keyte has told the Official Site that Peter Beadle was still under contract at Edgar Street. Keyte tells the site: “We have not heard officially from Pete about his appointment at Sutton, but must assume therefore that he has resigned from his Director of Youth position at Edgar Street for which he remained under contract." "Pete and Steve (Jenkins) did a great job, which in different circumstances, will have given them a tilt at the job, but I equally accept and understand with the uncertainty of the past weeks that they needed to get themselves fixed up. I wish them both well in the future." Both Beadle and Jenkins are understood, like most other staff at Edgar Street, to be owed several weeks money rendering their contracts immaterial. "There has been a number of amendments to legal wording along the way that caused delays. At the request of the group the details of the transaction will remain confidential at this time." “I queried the rumours of a trial game with our new colleagues and I have been told that there is no Hereford United trial planned for this Saturday." "I can also confirm that no manager appointment has been made as of today (Tuesday)." Tonight's HUISA members meeting has been told that the Club are still awaiting the money from investors to arrive in the bank account. The meeting was also told that a statement from the Club may still be sent out tonight. Former Bulls loanee Sam Smith is one of six released by Cambridge following their promotion. The 24 year old leaves after making a surprise appearance for the U's in the Play-Off Semi Final against Halifax - his first U's appearance in over 12 months and only the 12th game he started for the club during his two year spell. Also leaving the Abbey Stadium are Kevin Roberts, Andy Pugh, Matthew Barnes-Homer, Scott Garner and Blaine Hudson while Rory McAuley and Ashley Chambers have been told they can leave on free transfers despite having deals for next season. Bristol Rovers are to launch a bid to reclaim their Football League place at Wycombe's expense. The Chairboys were fined last week over a rule breach over the sale of former player Matt Phillips by the club's former owners. They were found guilty of a rule breach concerning third party ownership of players, with the Pirates claiming they should have had points docked for the offence if it is proven they breached rules last season. The Pirates will send letters to the Football League and FA to push the matter further, suggesting that a full scale investigation into matters should be launched. Agent Phil Smith was suspended for two years for his part, which he claims came about when the Chairboys' former owners asked him to take a cut of Phillips' transfer fee rather than a direct payment. When Phillips moved from Blackpool to QPR, Smith claimed a portion of the fee and was reported to the FA by the club's new owners. BBC Hereford & Worcester are reporting that a statement is due from the club later today. Trevor Owens reported that he had spoken to David Keyte, who denied that a new manager had been appointed and that there was no trial game planned for this coming weekend in London. Since posting details of the claimed trials match, the Twitter account making the announcement has been locked from public view. People who have contacted the mobile number listed on the messages say the man behind the account is named Don Ubah. 'General manager Dennis Strudwick has confirmed that the Conference has issued United a directive with which they have to comply, but was hopeful the Edgar Street club would "get all their ducks in a row" before the deadline. The Starlite Cafe will continue in it's new home of Addisons bar, opening four days a week. The Cafe will be open from 8.30am to 2.30pm on Monday, Tuesday, Wednesday, and Friday. Breakfasts, lunches, and light snacks are on offer with a takeaway service also available. In a Q&A on the club's official site, Barnet chairman Tony Kleanthous has told fans the club will seek to sell their old Underhill home. Kleanthous tells fans that he has put £7million into the development of a stadium at their Hive training ground, and they will remain on the site until they can build a 10,000 capacity new ground 'preferably' within Barnet. He suggests that 'not enough (fans) have the appetite anymore' for the Back to Barnet campaign that started following their move to The Hive last summer. Also in the Q&A Kleanthous calls the club's finances 'reasonably secure' but warns that 'cashflow is always difficult, particularly in the summer'. Kleanthous also calls the EPPP youth compensation deal implemented by the Premier League 'a disaster' and that they will face funding cuts to their youth department after relegation from the Football League. Bath City have cut their playing budget for next season by £70,000. The Conf South side are nearly £1million in debt but say the new budget is sustainable as they seek to cash in on their Twerton Park home. Telford boss Liam Watson says the club will not be held to ransom after captain Simon Grand joined ambitious Barrow. Watson is yet to tie up several of last season's squad but is prepared to lose them with several Conf North sides claimed to be spending big. Southport defender Aristote Nsiala is expected to leave the Sandgrounders for a Football League side according to Grimsby boss Paul Hurst. Hurst wanted the former Everton trainee but told the local press the 22 year old has been on trial with a League One side. The Mariners have named defender Chris Doig as the club's new Assistant Manager. The 33 year old will continue playing despite missing half of last season through injury. Hurst has also admitted an interest in released Nuneaton forward Wes York. Coventry have reported selling less than 400 season tickets in six weeks despite offering discounted prices to their disconnected fans. Their playing budget is reported to be cut for the coming season to £2million, roughly the same as Forest Green and Luton this term. Michael Rankine is set to join Harrogate Town according to message board reports. The big spending Conf North side have already signed Altrincham top scorer James Walshaw and veteran ex-Blackpool keeper Phil Barnes. Wrexham expect to lose the services of midfielder Johnny Hunt after it was confirmed he was in talks with a League Two side. Hunt, 23, was the Dragons top scorer with 12 goals and the Dragons would be due a fee. Director Barry Horne has also told the local press that keeper Joslain Mayebi and midfielder Joe Clarke have so far failed to respond to contract offers, while the Dragons are also waiting on news of ex-player Neil Taylor. The defender is expected to leave Swansea this summer with the Dragons holding a 10% sell on clause. 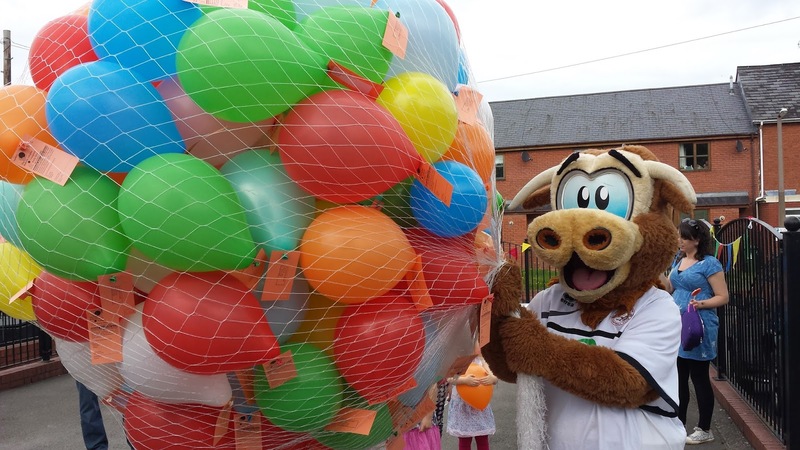 The new investor or investors in Hereford United could transfer some funds to the Bulls today according to a source close to the board. These funds are earmarked to settle the 'football creditors and also money owed to former manager Martin Foyle'. However the details are sketchy as the new investor/s has/have asked that all details remain confidential at present. Speculation has continued over the weekend that the investor or investors are London based. The winning numbers are 7, 20, 21, and 24. Should you have the winning combination, please contact liaison@hufctrust.co.uk to claim the jackpot. HUISA are holding their Members Meeting tomorrow night in the VP Club. The meeting is for members only, who are asked to bring their membership cards for identification, with the meeting starting at 7.30pm. A company called SS Global Sports are advertising a trial game for Hereford United through their Twitter page. The game is scheduled to take place next Saturday at Bedfont in London. The Twitter messages ask for first team, u21, and youth team players who will be watched by the new owners of the club. The company gives it's address on their website as being in Mayfair, with the address 'Landmark House' used by over 200 companies as a virtual office. The website lists no contact names. Bulls News understands that a manager has been identified by the new owners, and has already begun contacting players over the past week. It is expected that the naming of the new manager will take place on Tuesday along with the completion of the investment. HUST's Prize Bull Lottery has it's first draw tomorrow. The aim is to correctly pick the four numbers drawn each week. Entries are £1 each, with a 'Perm5' entry for £5 a week offering five lines. Standing Order forms can also be downloaded from the site, but Standing Orders can take up to 14 days to process. Macclesfield say that takeover talks are still progressing with several parties. The Silkmen have spent the last year in limbo after attempts to convert the club to a Community Interest Company failed due to their debt levels. The new Conference season starts on August 9th, with the final day on April 25th, 2015. The FA Cup Fourth Qualifying Round is on October 25th. Wrexham youngsters Theo Bailey-Jones and Jonathan Royle have signed new one year deals with the club. Winger Bailey-Jones made 22 appearances this season, while defender Royle spent the season on loan at Colwyn Bay. Histon have completed a reorganisation of the club's structure that sees them clear their debts and install a new board. Former Bulls Sammy Igoe and Tim Sills has been released by Gosport Borough. 34 year old Sills and 38 year old Igoe have been axed in favour of younger players. Worksop Town have resigned from the Northern Premier League after losing backer Jason Clarke. Despite the club being debt free it is unable to continue at that level without support, with Clarke reported to have put in £550,000 since arriving in 2010. Welling have made their fourth capture of the summer by bringing in midfielder Matthew Harriott from Northampton. The 22 year old, their first non-teenage signing, started only three games for the Cobblers but had a ten game loan spell at Alfreton the season before. Barnet have signed striker John Akinde on a two year deal. The 24 year old netted 18 times for Alfreton this season and was out of contract at the Impact Arena. He is the second Bees capture from the Reds, having signed Dan Bradley earlier in the month. Former Tranmere manager Ronnie Moore says his betting infractions have cost him £130,000. He was sacked by the Prenton Park outfit over 95 breaches of betting rules. He lost money on the bets, average stake £12, and won just £3.93 on a £1 bet involving his own side. He has been fined £2,000 by the FA and banned from football for a month, suspended for two years. Gateshead have increased matchday prices by £1 to £15 for the coming season. 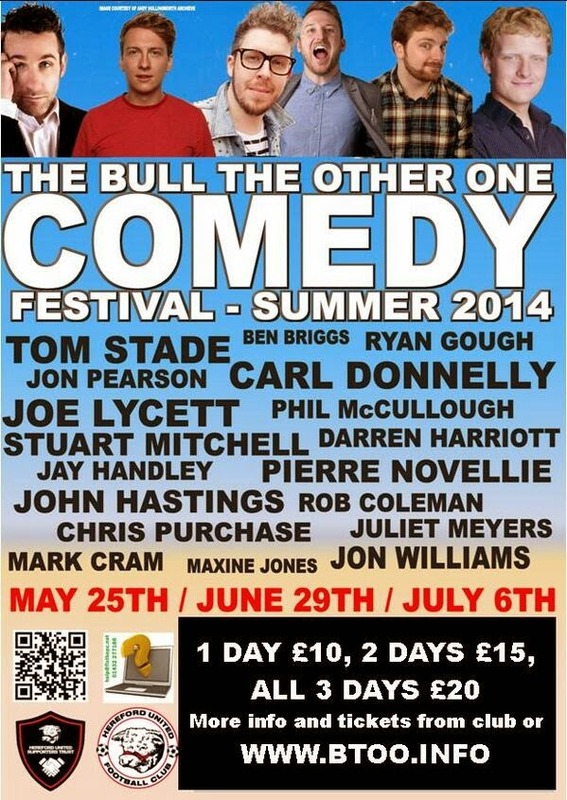 Adult admission will still be £14 if bought in advance. The Hereford Times is getting a new editor, with current chief Fiona Phillips leaving for a post in Newport. Phillips, who spent just over four years in the role, is being replaced by news veteran Clive Joyce. He spent 21 years at the helm of the Kidderminster Shuttle before 'retiring' last month as the local office was shut and production moved to Stourbridge. The Bulls have announced a third pre-season game, with a trip to Cheltenham to face Gloucester City. The Bulls will play the Conf North side on Tuesday, July 22nd in one of only two pre-season games they will play at Whaddon Road. Due to fixture congestion, they will play one 'home' friendly at Cinderford Town. The Tigers are also due to come to Hereford a week later, with a trip to Pegasus Juniors also on their pre-season calendar. On the same day as Peter Beadle was named as coach at Sutton, his assistant Steve Jenkins has been named as Merthyr's new manager. The Merthyr born former Wales midfielder leaves both the Bulls and Monmouth, who he led to the Welsh Football League title last week, for the Southern League 1 South&West side who missed out on promotion in the play-offs two weeks ago. He will be assisted by ex-Bull Gavin Williams, who returned home earlier in the year after a brief spell with Woking. Bulls News understands that the investment deal for the club is all but complete, and is now waiting on a cash transfer from the investors to seal matters. Terms are understood to have been finalised earlier today, with the ball now in the court of the investors to seal the deal. The club is expected to make a statement once the cash has been transferred. Manager Paul Doswell has filled the vacancy left by Steve McKimm's move to Tonbridge by appointing Peter Beadle as Sutton's new Head Coach. He will take up the post on July 1st. Peter was most recently caretaker-manager at Hereford United, guiding them to Conference safety on the last day of the season having taken over on Martin Foyle's departure in March, and was previously director of youth football at Edgar Street, where the youth team reached the 4th round of last season's FA Youth Cup, beating championship side Bournemouth and only going out to Manchester City. He previously managed Newport for three years, being in charge when they and Sutton were Conference South adversaries between 2005 and 2008, and has also worked at West Bromwich Albion's development centre. As a player he made nearly 400 senior appearances, half of those with Bristol City and Bristol Rovers, while other clubs included Gillingham, Port Vale and Notts County. The pre-arranged meeting of members of the Hereford United Supporters Trust in Radfords, Edgar Street yesterday evening was fortuitous in its timing - coming on a day when there was great expectations of a formal announcement of investment in the club and also on the day that the former manager Martin Foyle had issued a winding up order for the non-payment of salaries. The latter appeared but the former didn't - leaving supporters; members of the Trust, aghast at the lack of communication coming from inside the club. Initially the mood among the 60+ members attending, with another hundred tuning in on YouTube, was somber and serious having received an update on known events from Vice Chair of the Trust, Martin Watson. The clock is ticking and deadlines brought closer as the winding up hearing is 2nd of June (compared with 6th June for the Conference AGM). Describing the situation as being similar to a long slow death some supporters questioned just what is happening to the club, will the investment go through and most importantly will there be something to watch a Edgar Street next season. While HUFC and striving to settle last years debts other clubs are setting budgets, signing players and organising fixtures - another season of struggle is looming. A brisk question and answer session followed where members of the Trust we invited to talk about the current issues and strategies and responses given by the elected Trust Board members. Chris Williams, HUST Chair, who chaired the meeting recognised the appetite of supporters to still continue to support the club and summarised the meeting with the following actions. First, support was given from the meeting for the Trust to vigorously pursue their ambitions for representation at Football Board level. Secondly, on the completion of the new investment proposal, the Trust board was encouraged to seek an early meeting with the new football Board to clarify the issues surrounding the investment and to seek opportunities to support the new Board. Finally support was given to the Trust Board to continue to pursue the development of a United front for all supporters. London Bulls already have an affiliation with the Trust and recent meetings with HUISA have been constructive and positive. It is hoped that a Unified Voice will be stronger in representing the supporters views and opinions to the Football Club Board. The meeting closed with a call for support for Trust Board Treasurer Jack James' efforts of climbing Snowdon in June with over 100 Wrexham Supporters & representatives from other football clubs and trusts around the country. The primary aim of this climb is to raise funds to gain further shares in Hereford United Football Club (1939) Ltd and give the supporters a stronger voice - for more information and how to donate see the pledge pages on the HUST website here http://www.hufctrust.co.uk/march-top-wales-snowdon/ with some proportions of donations going towards the HUST nominated charity, the Adam Stansfield Foundation, alongside the newly rebranded United in the Community. Chair, Chris Williams closed the meeting on an optimistic note reminding Members the next season the club celebrates it's 90th year. He call for fans to work together to ensure we will still have a club and have a big party to celebrate! Former Bulls loanee Chris Weale is on the radar at Torquay if their two existing keepers turn down contract offers. Manager Chris Hargreaves has offered Michael Poke and Martin Rice reduced terms and will turn to 32 year old Somerset born Weale if they reject their offers. Hargreaves also wants Weale's former Shrewsbury colleague Asa Hall, while he says he has turned down offers for contracted pair Courtney Cameron and Krystian Pearce. Eastleigh have added another big striker signing by taking on former Wimbledon and Oxford striker Jack Midson on a two year deal. The 30 year old netted seven times in 40 games for the Dons this season. Welling have signed teenage striker Rod Young for the coming season. The 19 year old has just left Norwich's youth side, having had first team experience on loan in Conf South. Dover have released four players from their promotion winning squad with defender Terrell Forbes, midfielders James Rogers and Ashley Carew, and striker Elliott Charles all departing. Ex-Bull Nathan Elder is one of ten to be spoken to about a new deal, with four having already agreed terms. Salisbury are to trial released Cheltenham youngster Ed Williams in pre-season. The teenager had a loan spell with Gloucester during his first year as a pro. Supporters Direct spokesman Kevin Rye spoke to Howard & Toni on BBC Hereford & Worcester's Breakfast Show this morning. After a piece from Trevor Owens outlining the delays in an expected announcement, Rye was asked if it was unusual for a manager (Martin Foyle) to bring a winding-up petition against his former employers: "It is if he's owed money and he's sick of not being paid, to be frank." "I don't think anyone is desperately surprised. I have sympathy with the Hereford United fans and I have sympathy with Martin Foyle. I have no sympathy with the Directors of Hereford United." Asked about his assessment of the situation at Edgar Street, Rye added: "It's a slow moving car crash. I think the first time I spoke to you and said I'd thought we'd seen the end of them but this one is incredible that it's still going on and that there are creditors still coming out and saying they haven't been paid. "And now it's the manager who left. I'm incredulous that this is still going on and the Directors are still issuing statements saying they are confident they will pay it. If they're in this position now, what does that indicate for the preparations for the pre-season because if you haven't even started to think of next season, when some clubs are signing players, I don't know what's going to happen following it - even how they're going to settle the debt for the Conference with the AGM." Howard Bentham mentions the June 6th AGM date, and asks about a potential Bond requirement from the Conference: "It has happened in a couple of places but, to be honest, if they're scrapping around over paying a manager now and there's a deal in place, they have to prepare for next season. Assuming they do pay all the debts in full as required by the Conference, they do have to ensure the club is in a fit state to start the season. "That requires a squad of players, a manager who is happy. All of these things have to be done. This isn't like opening a shop, in a rush, for a sale. This is a football club having to compete on the pitch across the club. If it's not prepared - not ready - then putting down bonds becomes slightly irrelevant. "And the fans, and the community, have to have confidence in the football club. From where I am, and I'm not involved in this day to day, I wouldn't have any confidence at this moment in time that the club is going to compete adequately. "Frankly this is desperately unfair to the supporters and the wider community, and every bit of the behaviour of the Directors looks like they're not even thinking about the people who are actually going to sustain that club for the season coming. "All they're concerned about is solving the problem they've created. They are responsible at the end, and that's legally a fact. So it's a horrible mess we're having to watch here." 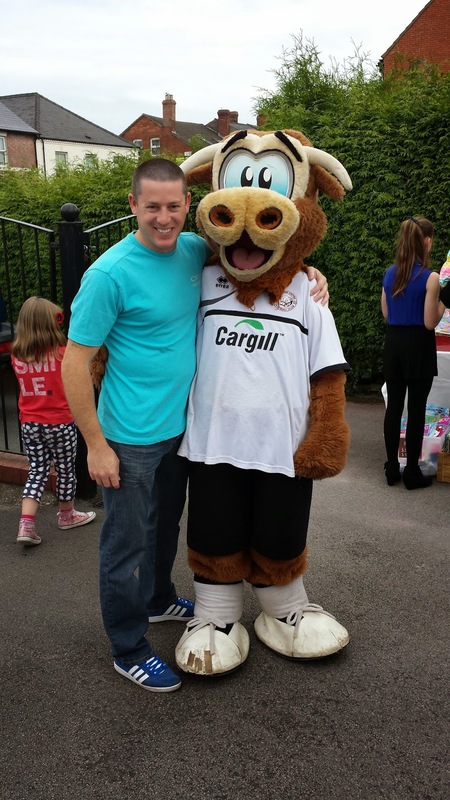 The current negotiations between Hereford United and investors has continued to go well today. Both parties have reached agreement and the matter is now being dealt with by each parties' legal teams. The agreement is expected to be finalised tomorrow (Friday 23rd May). The Football Conference have been fully kept up to date with proceedings throughout. The Official website will publish further news and details on this tomorrow. The current winding up order served by ex-Manager Martin Foyle has not come unexpectedly, the debt owed to Martin is included, and will be fully covered, by the above agreement. News outlets have been told to expect an announcement from the club this afternoon. "We are expecting everything to be concluded today (Wednesday) but the details will remain confidential at the request of our new partners. They expect us to continue to run the club but they will certainly want to be involved." Keyte has also denied suggestions that Peter Beadle is not in contention for the managerial job at Edgar Street, though BN sources insist that the former youth team boss was not interviewed during talks over the post last week. Club statement regarding current negotiations.